Wedding PR: Social Tables, AllSeated, Catersource and more! We’ve got another great week of client features for you- from Social Tables to AllSeated, Catersource and so much more! See below to check it all out. 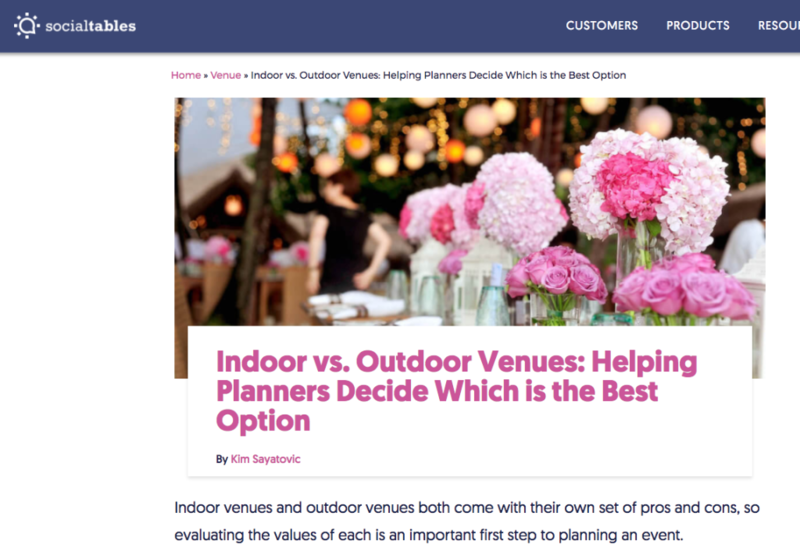 Belladeux Event Design was featured on Social Tables with her article, Indoor vs. Outdoor: Helping Planners Decide Which is the Best Option. See the full article here. Cocoon Events Management Group was featured on AllSeated with their article, The 3 Most Effective Ways to Select Event Entertainment. See the full article here. Fantasy Sound Event Services was featured on Catersource with their article, Are You Ready to Acquire a Business? See the full article here. 100 Candles was featured on Top Wedding Sites with their guest article, Incorporating Candles from Start to Finish. See the full article here. Mike B Photography was featured in the Baltimore Sun‘s article, Annapolis named best ‘under-the-radar’ destination wedding location. See the full feature here. 100 Candles was featured on I Do Take Two with their article, Dressing Up Your Intimate Wedding. See the full feature here. Cocoon Events Management Group was featured on Social Tables with their article, Searching for Event Venues: The Top 3 Things Planners are Looking for. See the full article here. Elly’s Photography was featured on Maharani Weddings with the wedding, Atlanta Fusion Indian Wedding. See the full feature here. 100 Candles was featured on Social Tables with the article, 4 Ways Outdoor Event Venues Can Win Over Clients with Unique Lighting. See the full article here. OFD Consulting was featured in Wedding Business Magazine. Get access here.